Enhanced GPS service (WAAS) now in use by the U.S. commercial aviation industry and activated 13 months prior to the terrorist attacks of September 11, 2001, provided virtual aerial navigation corridors only 243 wide and a 95% confidence that an aircraft's true position will fall within such a corridor . 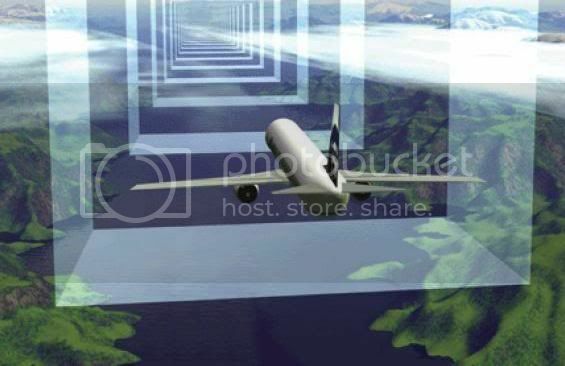 Such corridors can be navigated entirely by autopilot and flight management systems scheduled in 1996 and 1998 to be contained by United and American airlines Boeing 757 and 767 aircraft like those used during the terrorist attacks of September 11, 2001. RNP is a required navigation performance level described by the specification of a numeric value indicating the required navigation accuracy for a specific operation, typically specified laterally in nautical miles - e.g., RNP 1 is a Required Navigation Performance of ± 1 nautical mile (95% Probability). Digital flight control systems on Boeing airplanes ... automatically fly the airplanes on pre-selected routes, headings, speed or altitude maneuvers. Guided entirely by autopilot, an Air China Boeing 757 jet last month snaked along a narrow river valley between towering Himalayan peaks ... Pilots and passengers looked out to mountains left and right as the airplane automatically followed the twists of the valley, descending on a precisely plotted highway in the sky toward a runway still out of sight ... Using global-positioning satellites and on-board instruments, Naverus' navigation technology pinpoints the location of a fast-moving jet to within yards ... "You're watching the whole thing unfold. The airplane is turning, going where it's supposed to go ... it's all automatic." In October of 2001, Cubic Defense Systems applied for a U.S. patent for a system that utilizes GPS guided aircraft autopilot systems to implement a programmed or remotely transmitted flight plan, that overrides pilot control of an aircraft and navigates it to a given destination. Responsive to the override input, the manager deactivates on-board control of selected aircraft flight systems and the autopilot system, and directs the autopilot to fly the aircraft ... In planning the flight routing ... the manager may utilize ... GPS direct routing. so nobody can and should believe the BS on how NORAD, the FAA , the $ecret $ervice and the My-Pet Goat President were caught off guard. Guidance systems IMPLIES the obvious, built in FOOLPROOF DETECTION SYSTEMS. Even the SOVIETS at the height of their power during the Cold War would have found it difficult hitting civilian and military targets in NYC & D.C. respectively especially with CIVILIAN AIRCRAFT without SERIOUS HELP from the Inside and certainly NOT WITHOUT DETECTION. This is another Excellent entry from Aidan. constitutional911 on Thu, 04/30/2009 - 12:11pm. constitutional911 says, "Guidance systems IMPLIES the obvious, built in FOOLPROOF DETECTION SYSTEMS." Again, when it comes to NORAD's true monitoring capabilities on 9/11, one must research the historical record on NORAD. The implications of a detection system NORAD could use is void if NORAD says it didn't monitor American air space! brian78046 on Thu, 04/30/2009 - 1:00pm. ..."NORAD says it didn't monitor American air space!...." Yes. And Pigs can Fly. And now they call it the Flying Pig Virus or more affectionately known by Gilead Research & Tamiflu Venture Capitalists etc etc as Swine Flu. Looks like one of Obama's staff has just caught a whiff of it. My guess is NORAD was on a coffee break that day and were just bamboozled by the brilliant geniuses from Al-Qaeda. We just HAVE to trust the PENTAGON. They do Love Us and are there to Protect and Serve.I mean they Only misplaced 2.3 Trillion Dollars and counting. Its a trifle. constitutional911 on Thu, 04/30/2009 - 4:02pm. Your relentless pursuit of truth is absolutely amazing. I cannot put into words how important your work is to our future. Do you accept donations to help with anything you might need like FOIA fees or anything at all? ShawnB on Thu, 04/30/2009 - 12:21pm. Thanks for this. Really. It's all very interesting. Unfortunately it says nothing about what happened on 9/11. It certainly adds to the speculations in my head about what MIGHT have happened that day. A hobby of mine. But in terms of any actionable information this is relatively useless as far as I can tell. It says nothing about what actually happened. And it reveals nothing about who might have been responsible. Correct me if I'm wrong. Jules on Thu, 04/30/2009 - 12:46pm. Those who support the official story tend to throw it back in the face of us who show that story's major flaws by saying that it is impossible that there is another explanation such as remote controlled planes. This research shows that it is not only possible but completely supported by technology existing at the time of the "hijackings". cyberfossil on Thu, 04/30/2009 - 3:37pm. Most have always assumed that pilots were required to perform the aircraft attacks and that only suicidal Islamists described by the media would be willing. "There must have been suicidal hijack pilots so the official story must be true." Now one can see that there is a second plausible scenario. The timing of the emergence of this technology seems to parrallel that of the nano-energetic materials in the WTC dust - researched and developed technology known to very few at the time and covertly applied in my opinion. Many have wondered how AA 77 and the other aircraft could have performed their remarkable manuevers. Now we may know. Aidan Monaghan on Thu, 04/30/2009 - 5:06pm. penguin on Thu, 04/30/2009 - 12:46pm. I'm no "no plane theorist"
How can a plane hit a massive steal frame and concrete build tower and penetrate it like a bullet trough a balloon....? I just don't get it. Am I the only one here hwo find this is a topic that should be dug? Drummerboy on Thu, 04/30/2009 - 1:21pm. arie on Thu, 04/30/2009 - 2:30pm. Eras, I would not compare the kind of impact that a wood board would cause with the impact of 767.
and therefore this piece of wood has a greater capacity of penetrating a wall for exemple. A jet liner is not as solid. The side wings should have disintegrate or at least detache. Same thing with the rear wing. They sould'nt have stand the shock. For me the question is still unanswered. Drummerboy on Fri, 05/01/2009 - 1:31pm. Actually Arie the kinetic energy of an object goes up with the square of the velocity. Richard on Fri, 05/01/2009 - 6:08pm. The question was answered, Logan 5. "Our analysis [from their 1964 report] indicated the biggest problem would be the fact that all the fuel (from the airplane) would dump into the building. There would be a horrendous fire. A lot of people would be killed," he said. "The building structure would still be there." John Skilling, Lead Structural Engineer for the WTC, The Seattle Times, February 27, 1993. Now the only way a 707 could spill all of it's 23,000 gallons into one of the WTC towers is if the aircraft did penetrate the steel perimeter wall in the first place. I hope this answer helps others who seem to be preoccupied with Drummerboy's question. brian78046 on Thu, 04/30/2009 - 3:31pm. Kevin Ryan discovered that the floors that had the fireproofing upgrade corresponded precisely to the floors that were hit. My theory is that what was really going on with the "fireproofing" was actually prepping the towers with explosives to enable perfect penetration. The possibility of the planes (remotely guided in or using homing devices) bouncing off the buildings was not acceptable as it would diminish the "shock and awe" and perhaps ruin the 'official story". THOSE PLANES HAD TO PENETRATE! Of course the entire building was prepared for total demolition. Joe on Thu, 04/30/2009 - 4:44pm. Poltergeist or Something More Nefarious? I've thought of that too! One tenant reported loud noises above his floor for several weeks. One day he decided to take a look, and went upstairs. The floor was not only unoccupied, but clear of any signs that remodeling or construction was going on. He said the noise sounded as though it was coming from the area close to the windows. Maybe the perimeter columns were being weakened? The possibility of losing an engine while in the air and not having enough speed to penetrate a tower would certainly not be "acceptable" as you say. brian78046 on Thu, 04/30/2009 - 5:15pm. That's the only way, I think. Yes you're wright. A theory very plausible. That would be the only way, I think ,we could eventually explain this stunning fact (the planes melting in the buildings). Drummerboy on Fri, 05/01/2009 - 7:31am. please check arie's video posted above. it makes it quite clear. gerard on Fri, 05/01/2009 - 10:37am. the designers of the WTC studied a 707 impact at 600 mph, and affirmed in their report, "Our analysis indicated the biggest problem would be the fact that all the fuel (from the airplane) would dump into the building. There would be a horrendous fire. A lot of people would be killed," he said. "The building structure would still be there." John Skilling, Lead Structural Engineer for the WTC, The Seattle Times, February 27, 1993. Skilling says "all the fuel (from the airplane) would dump into the building". For that to happen the aircraft would have to penetrate. So here we have the designers of the WTC agreeing with you (and me) that civilian commercial aircraft could, indeed, penetrate the towers' steel perimeter walls. However, Flight 11 and 175 flew into the towers at 440 and 540 mph, respectively (and they have greater weight of 59,000 lbs.). Are the specifics of Flights 11 and 175s impacts enough to penetrate the towers. Has this been studied? 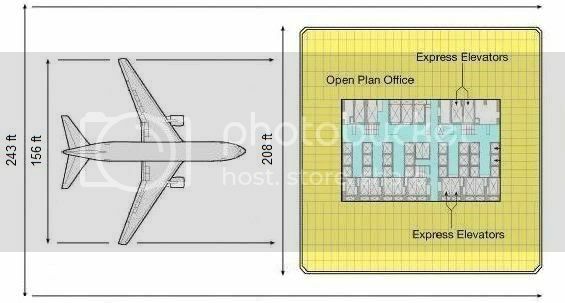 If I were involved in planning 9/11, I certainly would want to ensure that the aircraft entered the buildings for sure. One way to do that would be to weaken the steel by cutting it. brian78046 on Fri, 05/01/2009 - 9:51pm. Can a jet penetrate the WTC exterior columns? It's well established that the answer is yes. The NIST report models the jet impacts in great detail, and jet impact simulations were done by other groups as well. The results are consistent with the observables. What they cant to is accurately model the building failures. jkeogh on Tue, 05/05/2009 - 4:06pm. that's worth a blog entry. SnowCrash on Wed, 05/06/2009 - 12:09am. but in case the original Flight 77 was indeed equipped with the appropriate technology to react to remote-controlled navigation orders, we will probably never know. Your sources outline only the potentiality of such a scenario, not the actuality. Woody Box on Thu, 04/30/2009 - 2:10pm. "...During April and May 1995, Predator, as a proof of concept demonstration, participated in Roving Sands 1995, an annual air defense exercise held in the southwestern United States. The success of the Predator during this exercise played a substantial role in the decision to deploy it to the European theater in the summer of 1995. The Air Force has had the Predator UAVx and the capability to fire Hellfire missiles from them since '95. The ability for someone to fly airliners remotely has been the concept I had the least problem showing the technical wherewithal existed to do in 2001. Adam1 on Thu, 04/30/2009 - 7:48pm. how airliners could be piloted over an expanse of airspace and finally reach their targets. I always found it a stretch to believe that, without any guidance, the hijackers would have been able to pilot the planes over hundreds of miles of terrain and manage to find the World Trade Center towers and collide with them. Not being a pilot myself, I cannot judge how practical such a scenario is. pduveen on Thu, 04/30/2009 - 11:28pm. There's an intro which might be a little superfluous, but it works its way into a pilot-to-pilot/atc conversation with Robin Hordon. Basically, if flight 11 and flight 175 were piloted by Atta and al-Shehhi, they would have been able to fly into their targets assisted by the onboard "Flight Director". Mr. Hordon, feel free to comment. SnowCrash on Fri, 05/01/2009 - 12:21am. 1. I have known for years that aircraft have been able to be FLOWN VERY ACCURATELY AND VERY PRECISELY by onboard electronic devices. 2. I was well aware of the B707 REMOTE CONTROLLED departure, flying, approaching and controlled crash to evaluate jellifying jet fuel to see if post crash fires might be better handled. This happened in the 1970s...if my memory serves me accurately...that's almost 40 years ago. Please reread what I just wrote...smaller targets were EASILY visible to NORAD [we used to call it ADC...Air Defense Command] in the same area in the 1970s!!! 3. I was part of the modernization of air traffic control computers and RDP Radar Data Processing in the early-mid 70s...and at another time, I will make you all understand how the 24 second delay in the feed of radar data to NEADS from NORAD radar sites was the mechanism by which NEADS radar techs were not able to "see" targets so readily visible to FAA air traffic controllers...its quited complicated. Simply think "video games" when one uses one's control stick to locate a target and then when one pushes a "fire" button...it ELECTRONICALLY eliminates all traces of that ELECTRONIC or digital target. 4. I was an air traffic controller as the NAS [National Airspace System] began to loook into modernizing navigation systems which included RNAV [Area Navigation] and INS [Inertial Navigation systems] which are only some of the forebears to what Aidan is now explaining to you. In each upgrade significant levels of accuracy and immediacy of navigational and altitude information was accomplished...and the fittest of these innovations have survived. 5. Additionally, as all of our personal electronic devices have radically improved and become more sophisticated, so have the navigational, guidance and flight management [read: autopilot] devices utiilized by airliners improved and become more sophisticated. Consequently, its my current understanding that once at the end of a departure runway, the latest versions of flight managenemt systems can fly the aircraft from departure to landing without ANY manual pilot input of the flight control surfaces, throttles, spoilers or brakes. Its my understanding that inorder for the AAL and UAL B757 and B767 aircraft to have been remotely controlled, there would have had to have been some HARDWIRING MODIFICATIOINS NEEDED at some point in the aircaft's maintenance histories. This may have happened...but it adds a very, very obvious and complicated set of actions to get this modification accomplished in each of these four specific aircraft. At the moment I find this possibility unreasonable...but I am open because these thuigs are well funded and merciless KILLERS. I am hopeful, that Truthers will keep looking into this possibility...with the patience exhibited by Aidan. 7. With the NOTABLE EXCEPTION OF AA77 which I actually think may have been the "Operation Northwoods" airliner on 9/11/2001... I personally believe that there were cockpit intrusions in the other three airliners...and that suicide pilots performing acts for their god and country structures indeed DID change the routing and altitude "waypoints" in the flight management systems to fly the airliners into WTC1 and WTC2. 8. I DO NOT yet conclude that it was Muslim terrorists...and in fact I wonder openly about who WAS in the cockpits since so many of the "alleged" hijackers were/are still alive. I actually suspect that highly trained suicidal pilots who are NOT the Muslim aviation rookies as the "9/11 FABLE" now has it, may have been reprogramming the flight directors, navigational syetems, flight management systems...or all of these...in ways that put the coordinates of the sides of WTC1 and WTC2 into the navigation systems thus insuring contact with those EXACT COORDINATES...and within the tolerances shown possible by Aidan. 9. All the War Games and the June 2001 change to FAA-MILITARY procedures were geared to get all the frontline action people to think HIJACK-HIJACK-HIJACK which had the effect of delaying reactions because the Pentagon and Rummie would have had to be in the loop of approvals to scramble. 10. But the truth is that ANY air traffic controller seeing what Zelewski saw on his radar scope as he watched AA11 go HAYWIRE would FIRST presume an IN FLIGHT EMERGENCY...and, being the FIRST RESPONDER in civil aviation...he would take steps directly to NEADS and get military assets airbourne to help him out. This EXACT request was made by Colin Scoggins at ZBW [Boston ARTCC] some 24-25 minutes AFTER AA11 lost radio and transponder contact...and his demand was still IGNORED by NEADS. Additionally, I have read emails from Scoggins that established the fact that Zelewski was so frustrated that he had to fiinally stand up and begin YELLING that he needed the help that had usually been avauilable at his fingertips for decades. This behavior is so totally outside the normal reaction behaviors of air traffic controllers that I interpret it as an indicator that Zelewski was PISSED OFF that he had no appropriate help as ATCs had had for over 50 years before. To think that a team of ATCs would not react professionally, immediately, efficiently and within any and all...and even creating improvised...protocols...is absolutely UNACCEPTABLE TO ME. And these guys replaced me as air traffic controllers and I'm telling you straight out...I have their backs! WE/THEY just do not fail to react to in flight emegencies...its our GOD D____ED JOB!!! Its the US Military that was hoodwinked to deliberately fail on 9/11...by its own decadent insiders. And when the air defense sytem surrounding WDC was actually STILL INTACT...Cheney had to step in and disable it personally. Robin Hordon on Fri, 05/01/2009 - 11:04pm. Of course, the digital analysis shows other anomalies on the aircraft (in relief), but the above mentioned anomaly is the one that most interests me. When La Vanguardia (the newspaper that financed the digital analysis) asked Boeing's head office in Seattle about the strange forms seen in the photographs, the company spokesperson offered to cooperate fully in clarifying the matter. However, after studying them for several days, Boeing (whose engineers were taking part in the official investigation) declined to give an opinion citing reasons of national security. Remember when Fox employee Mark Burnback called his employer just after Flight 175 crashed? Mark said the airplane had no windows, and the anchor said over the air that it sounded like Mark was describing a tanker! brian78046 on Sun, 05/03/2009 - 3:56am. Supporting my view is the fact that FAA ATCs had turned on their primary radar displays to help keep track of these airliners and thusly, would have seen both the aircraft swapped in and then the aircraft swapped out of the swapping process itself. There were many, many trained and expert eyes watching the skies in the area and ATCs would have seen the two targets merge and then separate. Additionally, having worked at merging military aircraft for NORAD War Games reasons and airial refueling, I make this point abundently clear...its REALLY HARD TO DO...with the precision needed for such a swap or merger. For example, if a car ahead of you on the highway has a ten mile lead and is going 60mph...and you are trying to catch it with a car that goes 60mph [or just a little faster], it takes a long, long time to accomplish this. Now add open airspace, thousands of feet in altitude differences [four dimensions], the brevity of time and location to actually pull off the swap, and it really makes it all a very, very tricky manuever...and HIGHLY doubtful to have happened. So, the KC767 [and in the case of AA77, the C32 Boeing's military version of the B757], each fly at basically the same speeds and its hard to catch up. Circular flight paths would again, have been very visible to FAA radar. This limitation is different than the speeds available from interceptor types that need to be refueled in the air...they can catch almost anything. In other words, one of the the reasons that airbourne tankers fly in precise racetrack holding patterns as they await to refuel aircraft such as B52s etc. is because the B52 types cannot catch up to the tankers very easily. Thus, the tankers have to stay in these holding patterns until the B52 arrives. This was not the case for UA175 from what I can see...so far. No aircraft were in large holding patterns and the KC767 you claim hit WTC2 could not have caught up to UA175...and no additional uncontrolled aircraft flying at high speeds in the area were seen...and they definitely would have been seen...unless they had radar cloaking capabilities...something that Mark Gaffney's great book the 9/11 Mystery Plane takes a brief look at...so??? AA77 was totally lost to radar contact in eastern Ohio and nobody at any facility at any time in any location ever positively re-radar identified ANY airbourne vehicle as being AA77. There is enough radar data and controller testimony available that shows that there was at least eight minutes of total lack of radar targets, including any high speed primary radar blips, in the eastern Ohio region where AA77 was lost to positive radar contact. Now THIS is a window large enough for a swap in and out in that region...between the valleys of the Appalachians. Some radar data shows the possibility of a low altitude airvehicle being swapped IN over West Virginia. More at another time. John Farmer has some good data about this. The existing FDR for AA77 obtained via FOIA is a fabrication as AA77 was seen by the FAA radar systems and its ATCs begining a descent in its left turn just before it was lost to positive radar contact in eastern Ohio. The FDR does not show this descent and therefore, is a fake. 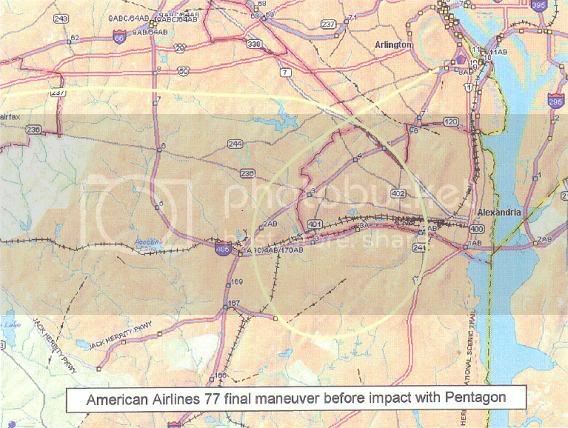 All the radar data and ground track analysis accomplished around the Pentagon based upon the FDR and the "alleged" AA77 is completely unreliable. In my view, the FDR data has been made of whole cloth so as to tell a story that the HI PERPS want told...one that contradicts the south track and one that gets Truthers to battle each other. When the unreliability of the FDR is commingled with Barabara Honegger's work about the first explosions at the Pentagon happening between 09:30-32 some 5-6 minutes before the "alleged" arrival time of the "alleged" AA77, the entire scenario at the Pentagon is even further muddled. My experiences in flying both as pilot and passenger over the years [I have 1600 hours of flight time] has shown me absolutely amazing visuals and MAJOR mis-perceptions due to reflections of sunlight, temperature inversions, cloud formations and the like. As we know, 9/11 was a very clear day with almost unlimited visibility...and had an early morning sun angle. This is something that should not be overlooked and should be studied further. At the moment I am quite comfortable with the images refered to as being generated by expected shadows and sun bright spots reflecting off of the shiny painted and metal surfaces. Same with what I see as a flash of light at the edge of WTC2 as the nose approaches the aluminum siding. I think that the eyewitness that you refer to was quite a few miles away and on the east side of the WTCs. UA175 was in a good sized left bank meaning that its left wing was quite a bit higher than the right wing thus blocking some windows...and its not hard to understand that from those combined angles and sun reflections, it may have looked like a windowless aircraft. Again, hopefully Truthers will still look at this possibiliy, but for me and for now, I'm comfortable about AA11, UA175 and UA93 [which I feel was indeed shot down] being the same aircraft that departed from Boston and Newark respectively. I only ask that we do this as meticulously and professionally as Aidan has done his work. No need for knee jerk reactions about this stuff...just a continuous analysis by those interested in this line of inquiry. Robin Hordon on Sun, 05/03/2009 - 1:54pm. Robin, concerning Flight 93, I have a source on that that affirms that Flight 93 landed at Cleveland, but wasn't designated Flight 93 (so the passengers on the flight at the time didn't know that they were on Flight 93). Remember the AP dispatch that had the Mayor of Cleveland saying that Flight 93 had landed and had been evacuated? Well, many say he was talking about Delta 1989. Delta 1989 wasn't evacuated until 12:30 pm, and the AP dispatch was posted at WCPO at 11:03 am! As for Flight 175, I have to go with the evidence (9/11 Truth is all about the evidence). The digital analysis confirms a KC-767, not shadows or sun bright spots. The object in relief I pointed to in my last comment is clearly not a shadow or a sun spot. The object is obviously in relief and matches perfectly the design of early KC-767 prototype/picture (did you look at the anomaly I was referring to in the digital analysis and then compare it to the picture of the KC-767? The anomaly I'm talking about isn't the so-called pod others have been debating about since September 12, 2001.). As for relying on FAA radar, don't hold your breath. If they can insert false radar contacts on NORAD radar, then they can program FAA radar computers to not pick up real contacts. That is one way aircraft could be switched in mid air. No need to catch up, simply rendezvous with each other. brian78046 on Mon, 05/04/2009 - 5:46pm. Dean, I agree that we must follow the evidence no matter where it leads...and these killer thugs have the finances, the skill sets and the REASON to pull this entire event off...and in many ways that we have perhaps not even thought of or discovered as of yet. I think that it is entirely possible that UA93 landed in Cleveland...but I don't hold that view at this time. I might note that AA77 was a B757 also...and when added to the "land them all anywhere" chaos that began to unfold around the time of the UA93 crash-shoot down-diversion, it could have been AA77 that landed at CLE. A Truther named Woodybox has some very interesting stuff about an airliner crash at Camp David [as well as some other stuff]...and I have third hand info that supports this view...[two eyewitness working in the area on 9/11 saw this...but who knows?]. Camp david sits at the northeast end of the valley in which there were no high speed radar targets...and then there WAS a high speed radar target...ie: the swap zone. And the fact that the Military uses B757s and B767s as their support aircraft means that if AA77 was flown to a "safe" military facility...[in the midst of this ATC-aviation chaos], the aircraft could have been easily converted for military use AFTER its occupants had donated their DNA...involuntarily if you know what I mean. So, there are thousands of avenues of investigation that can be researched and developed. For now I'm going with what I feel that I know and what makes sense to me regarding my life's experiences in aviation. I feel that the first reports that are/were obtained on such events are usually the most accurate and this is why I feel a strongly about the "AA77-Operation Northwoods" scenario. This is especially true since Burlingame was at the controls of AA77 upon departure from IAD. This is way, way too coincidental for me. ALL MY DOTS line up for a possible aircraft swap regarding AA77. My "dots" also applies to the military and FAA personnel who made some statements about a "shoot down" BEFORE they could be shut up. Barbara Honegger and I agree tha most likely it was a military airvehicle that made its way to the Pentagon and that it had an IFF transponder which would automatically disarm the WDC defense systems. Cheney may have been "taking one for" or "covering up for" the military because IF he did not state what he did to Mineta, [and that the story didn't EASILY make its way out from the PEOC? ], then any observer would have to conclude that it was a military airvehicle that made its way throught the NORAD-Secret Service defensive shields protecting WDC and was NOT a civilian airliner. Things are not always as they appear. Yet the existing primary Mineta-Cheney story or "stand down" option is also a strong case for that to have happened. In my view, when Cheney speaks, its all controlled and deliberate. When Richard Cheney opens his mouth, psy-ops comes out. He is the most evil character of my lifetime and is capable of anything. Cheney chose himself for Bush's VP...translation...the power elite wanted Cheney in the WH...and being VP was the only way that could happen because he is so miserable and unlikeable. So, they adorned the presidency with another Ivy League chump-chimp with a stolen election...and then had him follow Cheney's leadership. This is still going on as I write...and IMO anything opposite this view is historical revisionism being ramped up by the stenograper like corporate, and thusly, revisionist self-serving media. Cheney and Rummie were put in place by the small ruling class elite to pull this all off. There is little doubt that FAA radar data released may have been scrubbed and hacked [I think so]...and its the good old FBI that is the common denominator and obfuscater here...again-still. But, I have ferreted out some interesting information regarding radar data that will ask some great questions should any re-investigation get that far...or should we get the Controlled Demolitions established and then begin to look more deeply at other aspects of 9/11. This is why Aidan's work, along with your work regarding NORAD, are so essential. Its all great foundational elements. Although Christopher Bollyn has been discredited as being an anti-semite by the Zionists protecting Israel's involvement in the 9/11 attacks, [which of course most likely means that Bollyn is headed in the exact right direction], he has established a routing by which Israel-AIPAC-Mossad may have had backdoor access to FAA radar computers and radar displays on 9/11. So, anything is possible and I remain remarkabkly open about many, many things. Robin Hordon on Tue, 05/05/2009 - 3:13am. brian78046 on Tue, 05/05/2009 - 3:31pm. UA 175 on flight explorer after crash - last known heading? Note that the poster of that blog entry meant "flight explorer" instead of "radar". Note that I personally think it just indicates last known heading, but ok.
SnowCrash on Mon, 05/04/2009 - 8:26pm. Flight 175 Meant For WTC 7? SnowCrash, this is the first time I've seen this video! After the collapse of the south tower, MSNBC using Flight Explorer captures Flight 175 still in the air! This is outstanding! It only confirms that what crashed into the south tower was NOT a civilian airliner. As the heading to my last comment said, "Follow The Evidence No Matter The Seeming Contradictions". Flight 175 is probably being kept in the air because it is supposed to crash into WTC 7, but circumstances prevented it from getting to NYC. brian78046 on Mon, 05/04/2009 - 9:45pm. Pilots for 911 Truth has done some good work for sure, but, they strted out using flight explorere as an analytical tool, and have not dealt with the falsity of the FDR that is allegedly from AA77. The lack of such standards prevents me from remaining a member of that group. Here is a quick primer on tracks versus targets. Please note that NORAD commingles the terms tracks and targets when they do what they do and this has added tremendous confusion to the dialogue. ...a TRACK is a geographical representation of the pathway that an aircraft has made as it moves through the air...and it is shown in reference to the geography that the TARGET FLIES OVER on its journey. ... a TRACK is an electronically generated aplhpanuemeric set of numbers, letters and symbols that are electronically "attached to" a KNOWN TARGET by a computer systems that is designed to find a specific TARGET from the mass of radar data returns by recognizing either transponder codes or primary radar returns that are moving along pathways that are represented in some way by a computer filed data base known as a flight plan. This is the radar identification sytem in use at most radar facilities. The Flight Explorer system is a totally different and fabricated TRACKING system made available to the public that shows the location of selected TRACKS passociated with specific TARGETS. The Flight Explorere systems gets information about the wheareabouts of specific TRACKS for specific aircraft in the NAS [National Airspace System] from the FAA's ATC RDP and computer tracking information. There are no direct representations of REAL TARGETS in the Flight Explorere system...its only designed to TRACK the FAA's TRACKS. Consequently, if the FAA's TRACKS are no longer associated with a specific TARGET [such as would be noted by the "coast track" symbolgy seen in the FAA's FDB...Full Data Block...representation on the ATC's radar scope] because there has been a loss of a TARGET, the Flight Explorere system would have no way of knowing, or seeing a TARGET. Said differently, the Flight Explorer System is a tracking system that tracks tracks and has NOTHING TO DO WITH TARGETS. Therefore, when anyone depends upon the Flight Explorer Sytem to prove that the TRAGET..IE: the real aircraft...is still airbourne, its a false effort because it only deals with TRACKS. ...as a verb, the term TRACK represents what someone does personally by using their eyes as they "watch" a target move across the sky. Such "tarcking" usually is in reference to the ground where if the movement is recordedor some system does electronically does as they look at or watch a TARGET fly across the sky...IE: "I am tracking this target" as it moves along. In the old days of ATC we would write the call signs of aircraft on small pieces of white plastic [called a shrimp boat] that has a pointed corner. After each new sweep of the vradar antennae we would push this "shrimp boat" along with the target manually so as to keep constand positive radar identification with the aircraft's TARGET. In doing this we were "tracking" each specific TARGET. In all discussions about 9/11 it is very, very important to realize the differences between TRACKS and TARGETS...especially as commingled by NORAD as the Military has gone out of its way to expand confusion in the publics...and SOME professional's minds about TRACKS versus TARGETS. There are two noteable examples of how FAA;'s TRACKS have kept on going even though the TARGETS associated with those tracks were no longer visible to the FAA radar systems. Another is the TRACK of AA77 as it kept on heading westbound in COAST MODE along its flight planned routing AFTER the TARGET has dropped from FAA radar visibility in eastern Ohio. A quick aside...AA77 was lost to positive radar identificatio in the "convenient radar black hole that existed on 9/11/2001 in eastern Ohio. This is what Dean Jackson makes note of when he notes that the FAA radar returns may not be all that reliable..IE:...this black hole for primary radar coverage could EASILY have been created by an on site, remote, or back door computer set-up changes made by dark agents or plants in any facilities having access to the FAA's "Sytem's Engineer's" computer programming apparatus or codes. In other words, the FAA's radar and computer systems are "hackable". In both of the above COAST MODE TRACKS...the targets were no longer visible to the FAA radar sytem...the symbology in the FDB...Full Data Blocks...changed and informed the ATCs that there no longer was any TARGET information available to match the TRACK that the tracking system had generated...so, the tracking system kept on SEARCHING for a TARGET along the last known heading and speed for AA11 and the filed flight plan for AA77. Pilots for 9/11 Truth have been repeatedly informed of this reality between targets and tracks...between the falsity of the FDR that is allegedly that of AA77, and they still do not make note of any of this in any competent and clear way. Their last effort about UA93 as it flitted around Pittsburgh and Shanksville in and our of primary and secondary [transponder] radar returns thus affecting the alphanumeric TRACK as being in TARCK MODE or COAST MODE is easily misunderstandible and misinforming. Using TRACKS to establish that a TARGET was still airbourne or was still being "seen" by FAA radar systems by anyone, especially professionals in the 9/11 Truth Movement, is like Eric Clapton perfoming a concert using a plastic crank guitar. Again, Pilots for 9/11 Truth have been repeatedly briefed and educated about the differences between TRACKS and TARGETS and their conduct is unacceptable for the solid research needed to unwind the mysteries surrounding 9/11. However, I appreciate their efforts in many instances. As noted in the video at the top of this thread, simply put, pilots have only a TINY UNDERSTANDING about anything ATC...and they remain very uninformed even when informed directly about such ATC stuff. I don't get it? Robin Hordon on Tue, 05/05/2009 - 11:23am. robin, using your explanation for COAST MODE, I now understand that Flight Explorer is simply picking up FAA ATC scanning for Flight 175 along its probable flight path, AFTER the target (Flight 175) was lost. brian78046 on Wed, 05/06/2009 - 6:19pm. BTW, I think these folks over at pilotsfor911truth just need more ATC's on their team. Don't you have some former colleagues or ATC friends that are willing to chip in? They can change their name to "Aviation Professionals for 9/11 Truth (ap911truth)" while they're at it. I'm sure there are many additional areas of aviation expertise that are still missing from their ranks. Thanks again Robin, for taking the time to explain this. Remember, there are just too few ATC's actively involved in the movement. You can't moderate every forum and double-check every website. SnowCrash on Wed, 05/06/2009 - 6:11pm. Robin, I have Flight 93 landing at Cleveland BEFORE 9:03 am. To see how I arrive at this conclusion, see my article at www.DNotice.org titled, "One Of Our Aircraft Isn't Missing". It can be found under the Previous Articles section. I found some new (now old) information on United Airlines. I had already written the article when I was told that Flight 93 did, indeed, land at Cleveland Hopkins Airport. I have nothing to say one way or the other about Flight 11, except to say I believe it also was a drone, minus passengers and hijackers. I base this conclusion on the fact that not only are there no media interviews of airport personnel at Logan, Dulles and Boston Airports where the airport personnel recount their personal experiences with the 19 hijackers, but the media didn't interview the passengers and crew of the Portland, Maine flight Atta and companion were on (can you believe this ludicrous behavior where Atta catches a flight at Portland just two hours before Flight 11 is to take off)! Even a person with a real bad memory would remember Atta's face. I therefore conclude that the hijackers were NOT at Logan, Dulles and Boston Airports, nor were Atta and companion on the Portland, Maine Flight. brian78046 on Tue, 05/05/2009 - 10:30pm. I have replied in detail to this video and Aidan's work. However, since I mention Mossad and Israel and cast doubts on there being Muslim hijackers onboard the aircraft [AA77 is in a category all of its own...], my words have been censored. Robin Hordon on Sat, 05/02/2009 - 2:06pm. incredibly useful if for example you and mr. Monaghan explored the exact (hardwiring) steps that would have had to be taken to install (hostile) remote control into flight 11 and 175. Being an IT guy with a keen interest in security (and reverse engineering), I wonder how airplane firmware and embedded technology would be subverted for such a scenario. You have to be both an airplane technician and a hacker. Looking through the eyes of an attacker (in case of IT security, becoming one when doing penetration tests) helps you understand the various avenues that could have been taken, and the obstacles that had to be overcome. For example: which panels had to be opened and exposed, if firmware upgrades are possible in Boeing flight controls, what data cables and what software would be required, which embedded system would have to be compromised in order to override pilot controls (this seems far fetched, but okay). 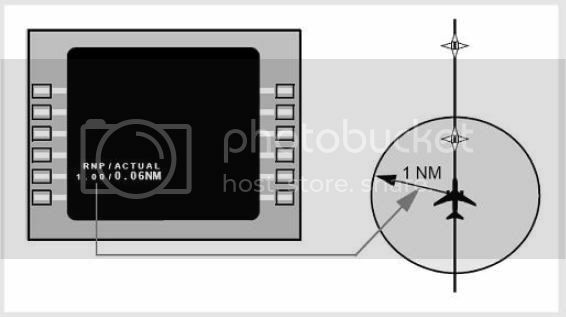 What kind of CPU is used in such embedded hardware, how does the transportation of signals from and to remote controlled commercial airliners work, to what extent does it require installation of additional antenna & receiver equipment, how to rule out pilots regaining control over their aircraft, did the NSA posses operation-ready aircraft flight control system rootkits, etc. etc. In essence, it would be a follow-up of this article, a full fledged technical exploration into this hypothetical scenario, but assuming the full wherewithal of the US covert operation apparatus was available to do the job. "How to prepare a Boeing 757/767 for involuntary remote takeover" so to speak. Unfortunately 'we' don't have the means to conduct practical tests, unless we were able to test such adventures on a near exact replica cockpit simulator or so. There would have to be some sort of proof-of-concept for a hostile flight instruments 'hack'. Maybe there'll be time for such an extensive exploration at some point. It's only one of many possible hypotheses, including Northwoods-style plane swapping, simple LIHOP with previously unknown levels of automated assistance, and so on. Thanks for the response in full, you weren't censored afaict. Personally, I'm convinced there was some Mossad involvement, either directly or indirectly. Israel has benefitted enormously from 9/11: economically (national security industry) and strategically. However, there is also this charade where all these foreign intelligence agencies, including the Mossad supposedly 'warned' the US. Compartmentalization or playacting, who knows. SnowCrash on Sun, 05/03/2009 - 1:46pm. Robin Hordon on Sun, 05/03/2009 - 11:29pm. immediately before Flight 77's (alleged) impact in Washington DC? MG on Thu, 04/30/2009 - 11:42pm. In our excitement to see the actual documentation on the remote piloting and GPS navigation, let's not forget that there is no real evidence that an airplane hit the Pentagon. And that airplanes did not bring down the WTC towers. They were brought down in controlled demolition. But, this is a good opportunity to share something I found a few weeks ago that disturbed me to no end. You wonder who is chemtrailing us? You wonder why NORAD wasn't on the job monitoring the skies over the United States? Take a look at the "Open Skies Initiative". Very simply, they have been disarming our country - leaving us totally open - sitting ducks for anybody to attack us at will. The 'new economy' they are planning is the updated edition of the Morganthau Plan for post- WWII Germany. Given that the alleged "leaders" of this country have so totally betrayed us, one has to wonder if 9-11 wasn't the final test of the full military stand-down - surrender of our nation. I do believe it was. eyeswideoopen on Fri, 05/01/2009 - 10:30pm. Jules on Mon, 05/04/2009 - 2:58pm.